Honestly, I wasn't sure if I was going to like this recipe but blog contributor the grandcruman was open to trying it, so I was in. And, I LOVED IT. 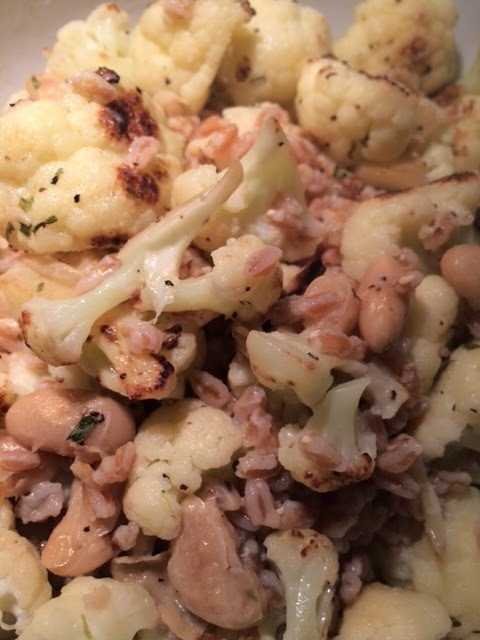 Here is the ingredient list, and you have to admit, it doesn't sound like it'd taste great: barley, cauliflower, beans, salt & pepper, lemon juice and zest, mayo, Dijon-mustard, olive oil, parsley and tarragon. As we try to eat more of a plant-based diet, this recipe is a keeper. Filling and flavorful. (I'm actually craving it right now as I write.) It's also a quick weekday recipe since it only took about 20 min to make.